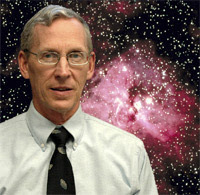 Dr. Don DeYoung (pictured), chairman of the physical science department at Grace College, Winona Lake, Indiana, and author of the recent BMH book Pioneer Explorers of Intelligent Design, is one of the featured speakers and workshop leaders for the upcoming Bible conference at the East Side Grace Brethren Church in Blacklick, Ohio (Chip Heim, pastor). Engage 2008 will be held Saturday, February 2, 9am-2:45pm at the East Side church, which is at 7501 E. Broad Street in Blacklick. The conference will begin promptly at 9am. Check-in for pre-registered attendees begins at 8:30am. The conference will begin with a brief opening session in the auditorium and the remainder of the day will consist of classroom style workshops. Attendees will have the option of choosing from 4 of the 7 workshops to attend. Cost is $25 per person or $40 per couple, with pre-registrations including lunch. Walk in’s are welcome the day of the event and will be charged the full rate, but will not include a lunch. Questions? : email to engageinfo@gmail.com or call East Side GBC (Columbus, OH) at 614-861-5810. Join us as we take a closer look at the history of the lost books and exactly who it was that chose the books which make up our Bible today. Dr. David Plaster, Senior Pastor of Grace Brethren Church of Columbus. It’s the Cell’s Environment, Stupid. A clear picture of what a God-honoring man is and how any man can strive to model these traits. Coach Mike Stanley, Head Coach of the Columbus Crusaders Varsity Football team and National Director for Grace Brethren Men’s Ministries. Presented by Dr. DeYoung, President of the Creation Research Society and full-time Professor of Physics and Chair of the Physical Science Department at Grace College in Winona Lake, Ind.